starting Pre-kindergarten on time made him among the very youngest in his class. The state, like Florida has a 5-by-Sept.1 rule for enrolling. thinking he might do better if he was older, more mature, a bit bigger. But the boy was also bright, a kid who seemed eager to learn and ready for more than preschool. What to do? Unsure, my parents in- law turned to an educational consultant that they knew. their view my inlaws after evaluating their other grandson Get that kid in kindergarten. So they did. And two years later, he’s doing well. I believe send the kids in pre school which is good because it's help the kid learn more. the way they meet other kids they also enteract how to learn like drawing, writing and many more, It say's student learn first at school. after those moment and in today My kid learns alot every year he progressive and develop he's mind. 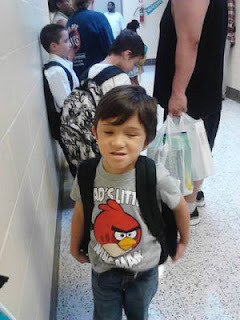 now my kid is in kindegarten. he well be 1st grade next year. So thankful to them, my mom inlaw and dad inlaw. although i still think of them and love them. awww...what a cutie! wow, such a smart kid...you are pretty lucky to have PIL like them. i so agree with you... my son started schooling at preschool and it helped him a lot socially and academically. Love his angry bird shirt! I agree pre school is good for them socially and academically. Since there are not a lot of kids around to socialize with pre school is way to go. aw.. such a cute little kid. its good to start them early so they will be prepared in going to kindergarten. Pre K is mostly playing at the same time learning. in Kindergarten it will be different.. and more pressured for kids. 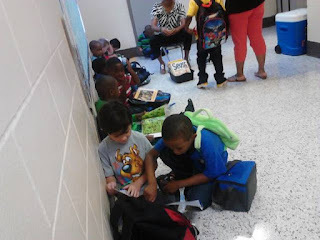 My boy didnt attend Pre K, so he was very nervous on his first day of school. but I tutored him well, and did a very good job, he was even consider in a gifted program. too bad he didnt pass it coz he was a very quite boy. =) good luck to your little man!